» Hemp seeds Hemp University hemp seeds | hemp seed | hemp nutrition-What is hemp? Hemp seeds can be eaten raw, ground into a meal, sprouted, made into hemp milk, made into tea, and used in baking. Hemp seeds are one of the earth’s best sources of easily digestible, high-quality protein. This hemp protein is awesome because, as we all know, proteins are among the body’s most essential nutrients, helping you build and repair tissue and build lean muscle mass. 65% of hemp seeds protein is high-quality edestin, making them the highest vegan source of this simple protein that’s required for proper immune system function. The other 35% is albumin protein. With live enzymes intact, hemp’s digestible proteins are easily assimilated into the body. Hemp protein is also a great alternative if you’re allergic to the proteins found in dairy and soy. In parts of Europe traditional soups such as Salesian hemp soup are still enjoyed. In parts of China, toasted hemp seeds are still sold like popcorn in movie theaters and by street vendors. In the Ukraine ancient hemp seed recipes are still shared. 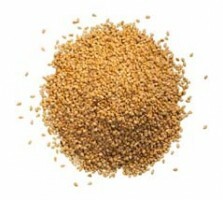 The Japanese use ground Hemp seed as a condiment. Polish cooks continue to bake the hemp seeds into holiday sweets. Hemp butter will soon be available as an alternative to peanut butter. It will taste similar while containing a healthier nutritional content. It is currently very popular in Russia. Hemp seeds may also be used in dairy alternatives such as ice cream. Hemp seeds may be crushed in a grinder to produce a flour that is capable of being mixed with any other flour to make bread, cakes, pastas and cookies. This seed is capable of being used as a substitute for meat in much the same way as the Soya-bean is used. Hemp seeds can be used as a protein and flavor enhancement in any recipe. No other single plant source can compare with the nutritional value of hemp seeds.